Many students at Mount Saint Mary College take advantage of their proximity to New York City (it's about an hour away), and are encouraged to utilize the effective internship office in order to find a hand-on application for their major.. After a day in NYC, the hilltop campus nestled on the Hudson will surely help you forget the bustle. What is a typical Mount Saint Mary College student like? Describe the type of person that should attend Mount Saint Mary College. What are the top 3 reasons someone should attend Mount Saint Mary College? What was a typical Mount Saint Mary College student like in high school? Describe the type of person that should attend Mount Saint Mary College. A typical student from the Mount in High school was the one who managed to balance grades, and played 3 sports, President of three clubs while volunteering twice a week at the local elderly home. Welcome to Mount Saint Mary College's website. Here, you can find information about our programs and campus life, and apply online. 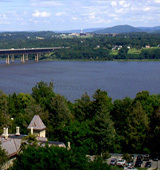 I hope you have the opportunity to visit our beautiful campus: a "gem" in historic Newburgh, New York, overlooking the Hudson River Valley. If you're a prospective student, you'll experience firsthand our wireless campus with the latest technology, our "smart classrooms" and laboratories, our nicely equipped residence halls, and most important, our state-of-the-art community. As a Catholic and Dominican college in the liberal arts tradition, we are guided by values and opportunities, and are recognized for excellence in teaching, learning, scholarship and community engagement. Catholic education is a rich tapestry of men and women working across fields of study, surfacing gifts which are enlightening and beneficial. We are committed to the intellectual, social, ethical, and spiritual development of our students: preparing them for professions and developing their full potential as lifelong learners. Our students bring a vigor that invites people to become involved in our diverse and vibrant community. The truth is, to lead is to understand others well enough to awaken their trust in themselves. We invite you to participate at the Mount, where we develop skills of mind and habits of heart. I look forward to meeting you. What are the top 3 things that students do for fun at Mount Saint Mary College? Campus housing is available for undergraduates. Housing deposit : $450.00. Housing deposit due : May 1. Housing deposit is not refunded if student does not enroll.. No cars. No pets. The average student pays $25,403 for tuition, fees, and other expenses, after grants and scholarships. Learn more about financial aid at http://www.msmc.edu/student_services/financial_aid. Estimate the net price for you at http://www.msmc.edu/npc. The typical (median) early career salary of Mount Saint Mary College graduates is $42,600, according to Payscale. Mount Saint Mary College participates in the NCAA Division III for college athletics.